University of Florida (UF) scientists are finding that by covering new citrus trees with mesh, they can keep disease-carrying insects from harming the plants. That could be a big step toward stemming the deadly citrus greening disease, UF Institute of Food and Agricultural Sciences (IFAS) researchers say. Asian citrus psyllids can infect the citrus trees with greening, also known as huanglongbing (HLB). But the psyllids cannot penetrate the bags because the diameter of their openings is smaller than the insects, said Fernando Alferez, a UF/IFAS assistant professor of horticultural sciences. Researchers call the system individual protective covers (IPCs). 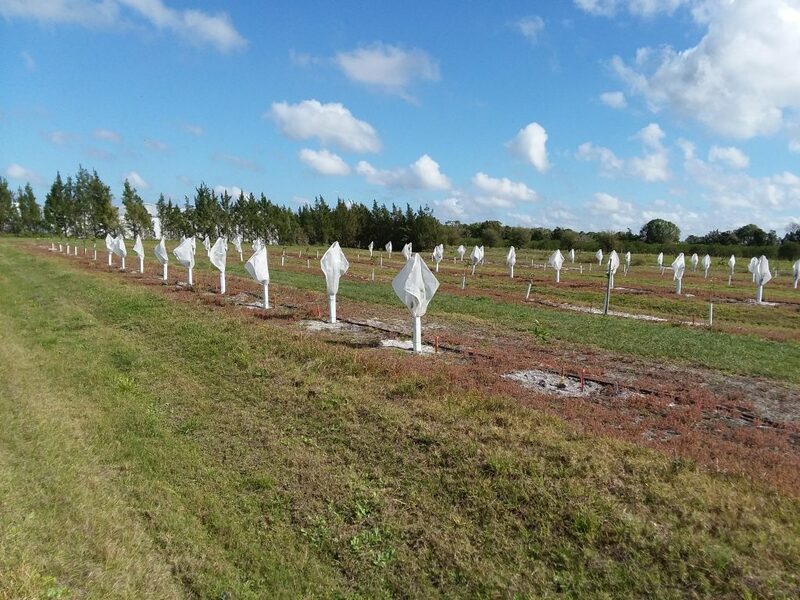 Scientists are testing IPCs in an experimental grove at the UF/IFAS Southwest Florida Research and Education Center (SWFREC) in Immokalee, Florida, and in some commercial groves in the state. Although the covers are in the research phase, an increasing number of citrus growers are using them, Alferez said. Typically, the covers are installed immediately after the new trees are planted and stay there for two years, Alferez said. With no psyllids getting through the mesh, trees avoid infection for the two years the cover is on the plant. Without infection, trees increase the likelihood they’ll enter the fruit-producing stage disease-free. View more information about the protective covers.